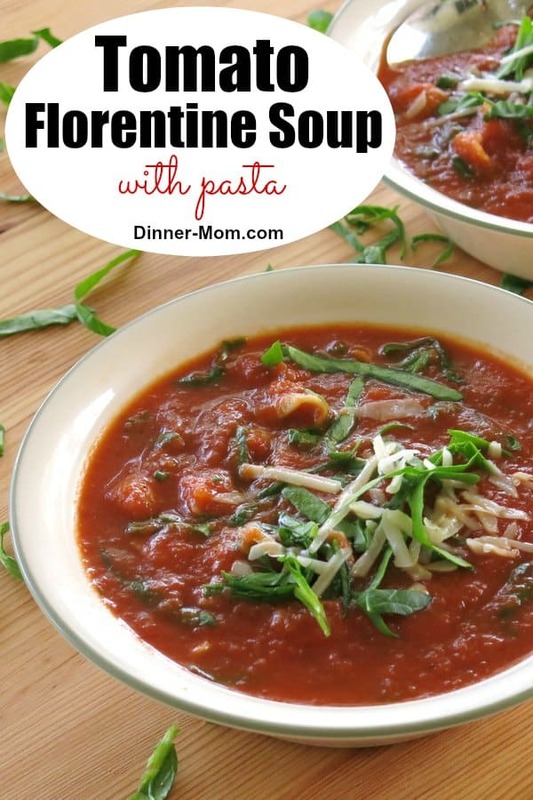 Even though this easy Tomato Florentine Soup with pasta is ready in under 20 minutes, it will taste like it cooked all day. It’s infused with flavor from a Parmesan Cheese rind that simmers along with the pasta. Make extra to freeze! It is a based on classic version that stands alone. Make it “creamy” by adding a little milk. For another version, stir in fresh basil. It’s like a blank palate ready for experimentation. 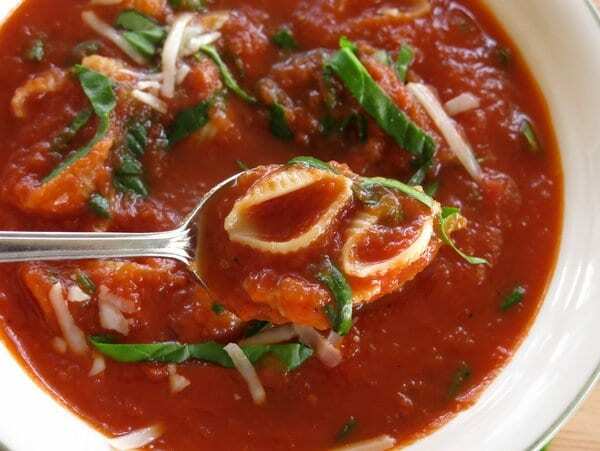 Check out Roasted Tomato Soup with a Spider Web Topping if you have a similar passion for jazzing up your soups. It’s also nice with a few Parmesan crisps scattered over the top. But, it was the basil variation that got me thinking…on a day when I was out of fresh basil but had plenty of spinach on hand. Yep. I know it’s not earth shattering and I certainly didn’t discover it. In order to inch closer to a complete meal, I added whole wheat pasta shells. The pasta doesn’t have to be cooked first. Just stir it in once the soup is brought to a boil. Easy. If you add a little protein (like chicken or chick peas) then dinner is done! To chiffonade the spinach leaves, stack 6-7 leaves, roll them and cut them into strips with kitchen scissors. It makes quick work of this task and is so easy to do. It’s a bit of an obssession. Although the taste is completely different basil, a dish is quickly prettied up with a sprinkling of thinly sliced spinach leaves. Also, be sure to make a double batch of tomato florentine soup, because it freezes beautifully. 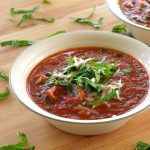 Easy Tomato Florentine Soup is ready in under 20 minutes and is infused with flavor from a Parmesan Cheese rind that simmers along with the pasta. Add olive oil to pot and stir to combine. Add onions and garlic to pot and saute for about 5 minutes or until softened. Add tomatoes, broth, salt and pepper to pot and stir to combine. Puree soup mixture using an immersion blender or a food processor. Add rind from Parmesan cheese wedge to mixture, if using. Bring mixture to a slow boil. Add pasta shells to soup. Remove undissolved rind from soup. Stir in spinach, reserving some spinach for topping. Garnish with additional Parmesan cheese and spinach. I am partial to boxes of chopped tomatoes that are unsalted and don't contain added preservatives. However, 2 14.5 ounce cans of diced tomatoes can be substituted in this recipe. South Beach Diet Phase 1 - do not add pasta. How can you go wrong when a Parmesan rind is added? So good. This looks so delicious! Perfect for this time of year, like you said! Pinned! Yum- I have a bag of parmesan rinds in the fridge just waiting to be used- thanks! These are the type of recipes I like because they are healthy and easy AND taste delicious! Thanks so much, especially for the idea on the Parmesan rind. Che bello! I keep my rinds in the freezer. Love all the flavor they add. I just adore the added vegetables by throwing spinach in. We always save our Parmesan rinds for soups and stew, too. It’s amazing how much flavor they can add! I’m a long-time fan of tomato soup, and this one looks so satisfying. This looks like just the kind of soup I need today. So perfect and I love the added spinach and parm! You can’t go wrong with a parmesan rind in you pot of soup! This looks amazing! Gotta make a huge batch of this and freeze some! I love that you can make a whole meal out of this..nice and hearty. I love parmesan! 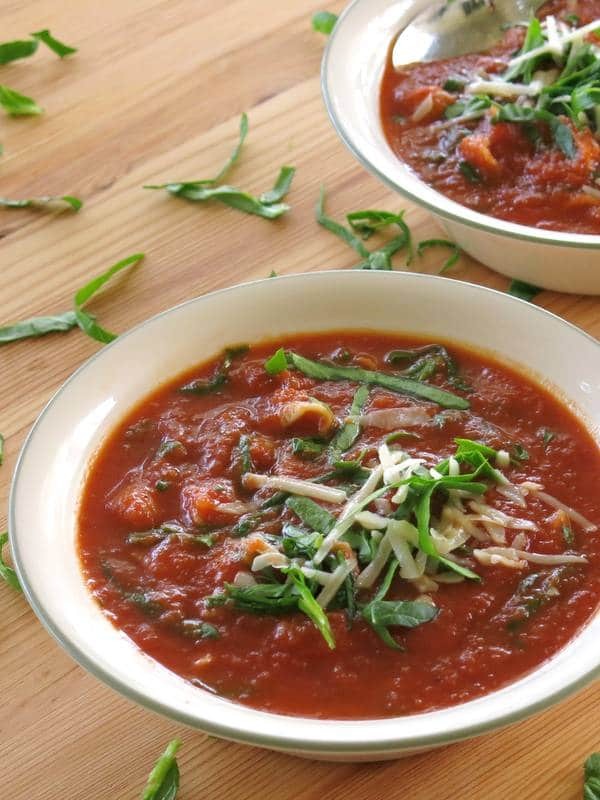 This soup looks so comforting and delicious! 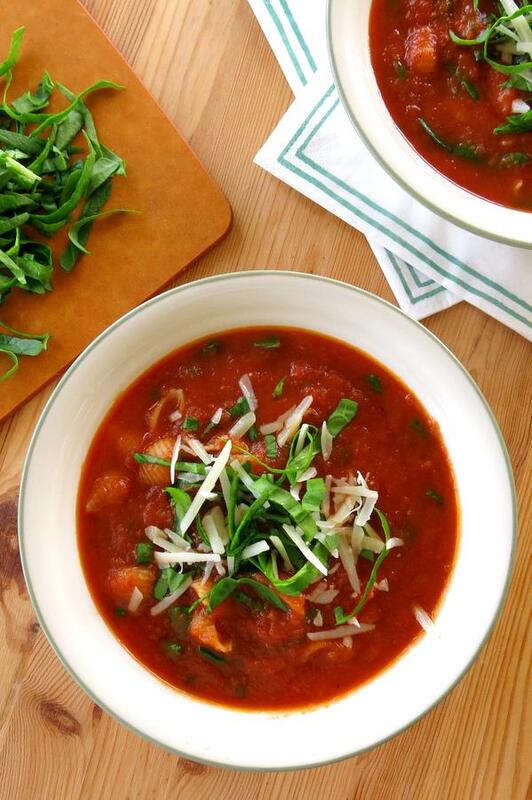 Your soup sounds so amazingly simple but delicious! Perfect for weeknight cooking. 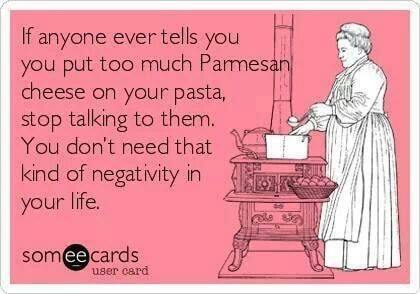 And I love the quote about too much parm on pasta–amen to that! I never thought I would even like tomato soup and coming form an Italian household we never had it growing up, too much like sauce. But this past fall I had a version at the Big Potluck conference in PA and fell in love, super yummy! Oh, yes parmesan rind is just like magic. I add it to risotto, soups, pasta sauces…it just makes everything so much better. 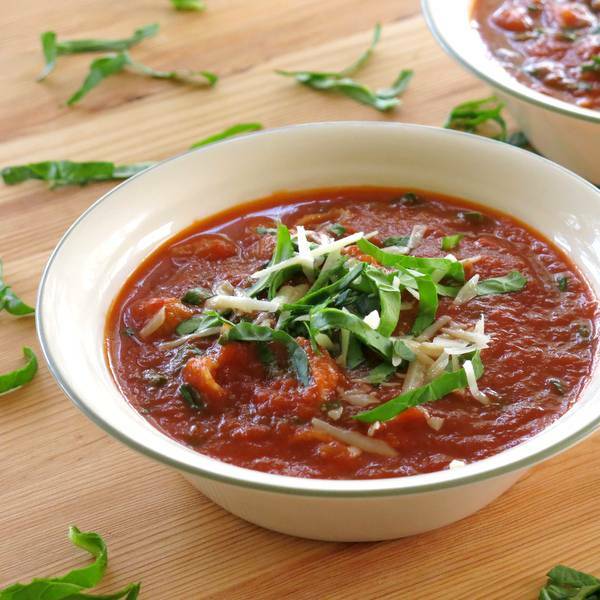 We love soup and tomato soup is one of my favorites; maybe it’ll be what’s for dinner in our house tonight. I also compulsively save parmesan rinds! I love the idea of popping it into a simmering tomato soup. I will definitely try that trick. I’m always looking for new and yummy soup recipes, especially this time of year. I’ll put this on my “to make” list ASAP! I wish I had read your post/recipe ealier haha. I was craving tomato soup like crazy and really wanted some for dinner but didn’t have what I needed. Saving this! I’ve heard of people using the Parmesan Cheese Rinds in their soups but I haven’t tried it yet! I’ve never used Parmesan rinds for cooking but now it sounds like the best idea ever to me! I’ll need to try it out! Once I realized that real tomato soup was not Campbell’s, it’s really grown on me. Love that you simmer a Parmesan rind in this one. I always have a ton of those in the freezer! This looks delicious – and fresh tomatoes are so good for you. Thanks for sharing – I definitely will freeze some of this. Do you have the nutritional information likes calories etc? This sounds amazing. I’m so glad that you like it. We suggest that you use an app like My Fitness Pal or Calorie Count to calculate nutrition information. I”m all for a 20 minute meal! This is a lovely looking soup. I love using parmesan rinds in cooking! I also always end up with lots of different rinds hanging out in my fridge so when I first learned you could use them in soups or pasta sauces I got super excited too. I love how fast and easy this is, perfect for busy weeknights! You had me at Parmesan cheese rind hahahaha. 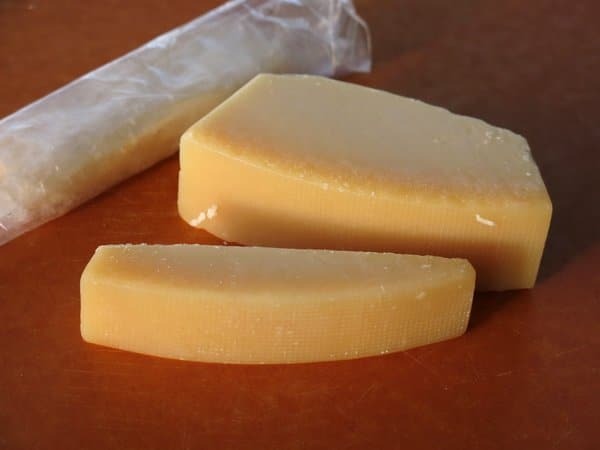 Anything infused with a parmesan rind is going to be all sorts of wonderful. What a lovely wamring soup! And all the more hearty for the added pasta. I love it! I take tomato soup in any shape and form. Your florentine version sounds super delicious to me. I have to try it! I always like to experiment with different types of tomato sauce. Since chicken is not part of my diet for some time, I rely on tomatoes and other protein-rich foods. The idea to add pasta shells was brilliant because that is something to chew on. What I do sometimes is deep fry cubes of bread and then add it on the top. Mix while eating so that you get this little crunchy, little mushy effect. Pasta shells is a new thing for me! Keep up the good work, dear! Thanks.